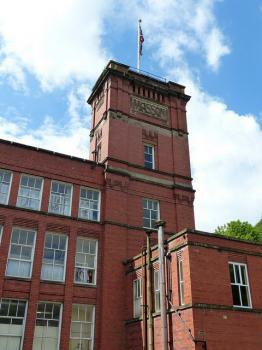 Derwent Valley Mills comprises a well-preserved historic landscape of industrial buildings and worker's houses. 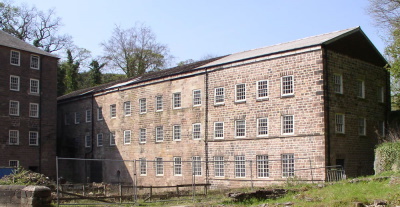 The story of the Derwent Valley Mills starts in 1771, when Richard Arkwright began to build a water powered mill for spinning cotton at Cromford. Developing his water frame, that could be operated by young people with very little training, factory production became possible. The workers lived in an especially built village. The A6 from Derby to Matlock is the place to go when you want to see the Derwent Valley and its mills. It's a small road that crossects green valleys and passes tiny towns. 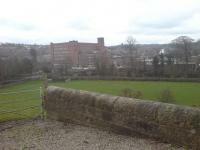 I started my tour in Belper, a somewhat larger town with a prominent mill (unfortunately closed today). The first mill I could get into was Cromford Mill. There are now shops and a small exhibition room, there's not much to see otherwise. Finally I went to Masson Mills. This is also turned into a shopping center, where you can buy fancy things like golf clubs and towels&soap. But there is more: a large part of the building is now a working textile museum. Here you can see the spinning and experience the noise in the large factory hall. March 2018 Roadtrip through England. Just after leaving the park we came to the WHS Derwent Valley. Unfortunately we did nor really know what to expect. Therefore we went past the most interesting town in the north hoping for some amazing architectural icons on the way. The remaining mills looked quite poorely. Some had cheap shops, some hotels. But we did nor really find a spot to stay longer. After 45 minutes we were already at the end of the WHS. What a pity. Unfortunely one of the rather dissapointg sites on or travels so far. Well, but England has a lot more to offer also in terms of industrial sites. I visited this WHS in June 2016. 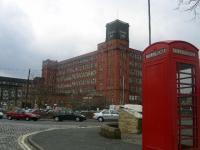 I drove the A6 from Matlock to Derby, stopping whenever there were any sites of interest related to the Derwent Valley Mills WHS. 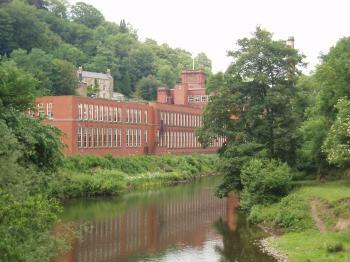 The surrounding area is very green although there are several industrial sites and the mills around Cromford are almost hidden behind trees. 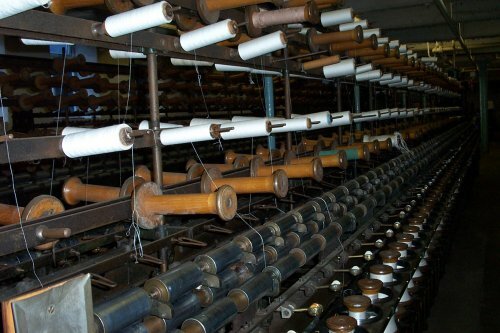 Probably the best site to head to is Masson Mills as there are machinery demonstrations in the weaving shed at 11am and 2pm weekdays and at noon and 2pm on Sundays. These demonstrations and the thorough and very interesting explanations given by the Working Textile Museum make all the difference. Having visited quite a number of industrial heritage sites now (and still not being such a fan of industrial heritage sites), those that I enjoyed most were those which could be appreciated as fully working industrial sites and not mere empty buildings or rusty machinery without any visual explanation or some sort of demonstration showing them in action. The noise levels I experienced with just a few machines switched on, together with the thorough explanations on the site's importance, how things worked, what was their use, but also on the poor health and safety conditions. It was a very short demonstration (thankfully) but it really gives you an understanding of what this WHS is about. Unfortunately the museum is understaffed and lacks funding but the employees there are really doing an excellent job and keep this WHS alive. On the negative side, once again the top floors of Masson Mills have been converted to a cheap department store and although there are WH signs outside of the building, inside you have to make an effort to spot the tiny sign leading to the museum among the huge flashy advertisements and discounted shop prices. I would have absolutely no objection for businesses to use the empty parts of such buildings as this generates jobs, keeps the place alive and provides a number of services. However, the management has to strike a balance between giving the WHS full prominence in signage, building plan, etc. and providing space for businesses and shops. The Derbyshire Wayfarer ticket is a usful way of visiting this WHS. It covers all the buses and trains between Derby and Matlock. Besides the mills themselves I was interested to see the Cromford wharf, where goods were loaded onto barges and distributed around the country by canal. I have been to and inside Cromford Mill for the morning on Wednesday 30th April 2008. I really enjoyed it and I would like to go again. I spent an nice afternoon following the A6 from Cromford to Derby, which gave me a chance to view most of the sites inscribed on the list. Masson Mills (pictured) on the edge of Cromford, has a textile museum where you can see some fabric making machines in action, the staff here were dressed like mill workers and they were really dedicated to the up-keep of these machines and they took great pride in explaining small details to us. The museum was nice but I was not massively interested in the process and I whipped around pretty quickly, the main body of the mill is now a shopping centre. A little further on was Cromford Mill the worlds first water powered cotton mill, and I was very disappointed here, this was the site I was looking forward to but the main courtyard was very untidy and the museum was exceedingly outdated, again the people running it seemed very dedicated, but just needed some real investment to get the best out of the site, Next to it is a nice stretch of the Cromford canal. The mill at Belper was one of the first Iron Framed buildings in the world, an inspiration for many architectural advancements that came later, noticeably the early skyscrapers, it looked a little like the work of the Chicago School. Both Cromford and Belper were planned towns for the workers of the mills but I only managed a quick look as I drove through. I finished off in Derby, a very normal English city that had the world's first factory and the Silk Mill is now an industrial heritage Museum, unfortunately it was closed by the time I got there. The natural surrounding of the Derwent valley was very nice, and the transport links were excellent, there is a railway station with in walking distance of each of the major sites. On the whole I enjoyed my day at the sites, and it is defiantly worth its place on the list, but some sites could do with some investment of money as there are people dedicated to their up-keep. 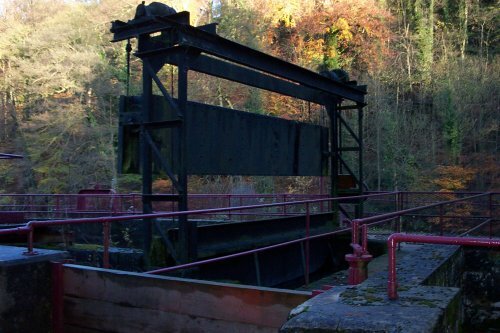 This site goes into the lower catagory of sites that i have visited and it is not a must see unless you have a real interest in Mills or engineering. 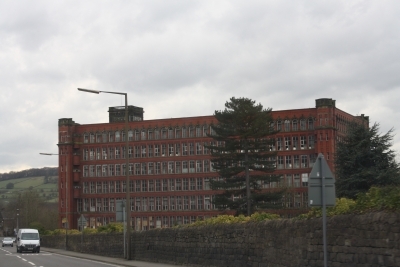 Derwent valley is the cradle of factory system which made not only a productive order,but found the worker's quarter based on the humanitarianism. I've been to some mills,North mill of Belper was most impressive for me.Almost all mills are now used as museum,restaurant and youth hostel and located on the magnificient gorge.And formerly Sir Richard Arkwrit's castle,which is located on the hill near his mills,is now a inexpensive hotel. Whilst I have visited both Cromford and the later Masson Mill, it was Cromford which has inspired me to write a show about it, so a previous correspondent may yet be pleased. 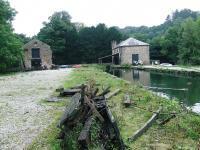 But it is the preservation of Cromford Mill and the work done by the Arkwright society which is of the great importance. We think of it in England as the beginning of the Industrial Revolution, without quite knowing why. 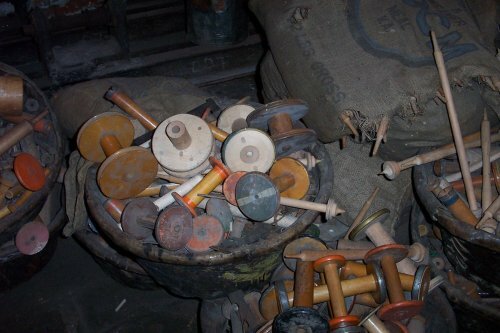 The first factory was the Silk Mill at Derby, but Cromford pressaged the complete mechanisation of common product. It inspired me to go into the history of it all and all the subsequent social and political turmoil. Not to mention the characters of the men who set it all in motion. They were not the later mill owners. Yet what started at Cromford had repercussions all over the world. The valley itself starts immediately after the outskirts of town so if you drive to Matlock you should see all the mills. One mill is even in Derby. First on the road is in Darley Abbey - unfortunately we missed that as there was no sign for that in advance. In Belper the sign is good - you can park next of the mill. Opening hours are only from 1pm so i had no possibility to go in. Mill is placed in a romantic country surrounded by the river and gardens. I can imagine i could spend there some nice evening with my girlfriend :) We missed Cromford mill which is some miles north as it is not on the main road but near of it is the Masson Mill. I was quite surprised when i saw there is a shopping mall and a parking house inside. At least there is a museum. As we were in a hurry i was not able to enjoy the whole place, but i'd like to go back as the country is beautiful around the river and the history is around you - as the area looks like you havent moved away from 19th century. There are some guides for walks and i believe it is worth to take a nice walk. I very much enjoyed my 3 visits to the shopping complex. The 3nd time my friend and I went round the museum this was interesting to see how the past generations had worked. We traveled my train to Matlcok Bath and by bus to get to the complex. Luckily the bus stops are very close for when the weather is awfull. It is very good to see the building in use again. Keep up the good work. Coming from Derbyshire, Cromford and the mills have always been of special interest to me. There is so much history about the development of the textile industry and how it effected peoples lives on a huge scale yet there is hardly any information at the site, or around the village - which is just as steeped in interesting, relevent history. For its importance there needs to be some serious investment in this area to make people just as fascinated in it as I am. Something to get peoples' spine's tingling with all the stories, experiences and facts of a time that was so important, not just some 70's documentary and a freezing cold out dated exhibition. I am sure that anyone who is visiting the area as a tourist will be hugely dissapointed. Which is very sad! This beautiful area which is easily accessed from Derby via the A6 is a very interesting journey through the history of Derbyshire's Mills. Each of its sites is set amongst picturesque Derbyshire countryside with many other attractions such as stately homes,museums and industries to visit nearby. Using the transpeak bus service my family and I enjoyed a wonderful day there. Water wheels: Water wheel in Cromford (appears to be within the inscribed area but not the original location!). There is also a small water wheel at Slinter Cottage but this may not be working yet. Golf Courses: Chevin Golf Club: the boundaries of the WHS seem to run around it's perimeter, but because the course goes over the railway tunnel, the Par 3 4th Hole is entirely within the WHS boundaries. Cultural landscape not recognized: Clearly described as a CL in 2001 AB evaluation. Is industrial landscape, relict.